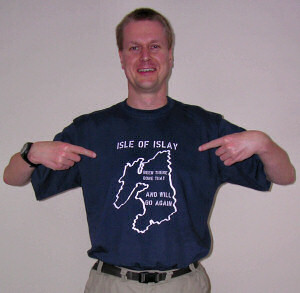 Late last week I blogged about Armin's Little Islay Shop with the designs for my own Isle of Islay t-shirts and a few other things. 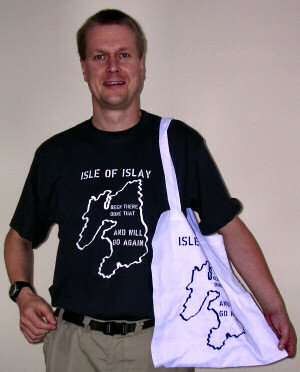 My last order has now arrived and I thought I 'model' my own t-shirts to give you an idea of how the author of this blog looks as well as how the shirt looks. In the second picture I've added the cotton bag, good for the daily shopping or carrying a few books or anything else you might have to carry around. I plan to take it with me when I go shopping to avoid having to use (or at least reduce using) plastic bags. That's about it. I hope to create more designs over the coming weeks, after returning from my upcoming holiday. More about that later.